Uses the Onkyo-EISCP python library to try to send a EISCP command to the receiver. This is the only reliable way to determine if the various media services on the receiver are in a working state. When the receiver is in this state, the web server will still respond, and it will function normally otherwise, so EISCP commands must be sent to see if a response will be generated. This is the basis of the “health check”. Creates a small function to talk to my Vera Lite zwave automation controller. This controller has a smart power switch associated with it that the receiver uses for power. The Vera API talks in JSON format, So we define a multi-line dict that contains the information needed to control our power switch (Id, Device Number, Service ID, action, and target value). We also define a EISCP library object with the IP of our receiver for later use. Next, we create a simple function that will send a http GET request with our previously defined JSON dict objects depending on the condition we encounter. The main part of the script is a try/except/else flow. 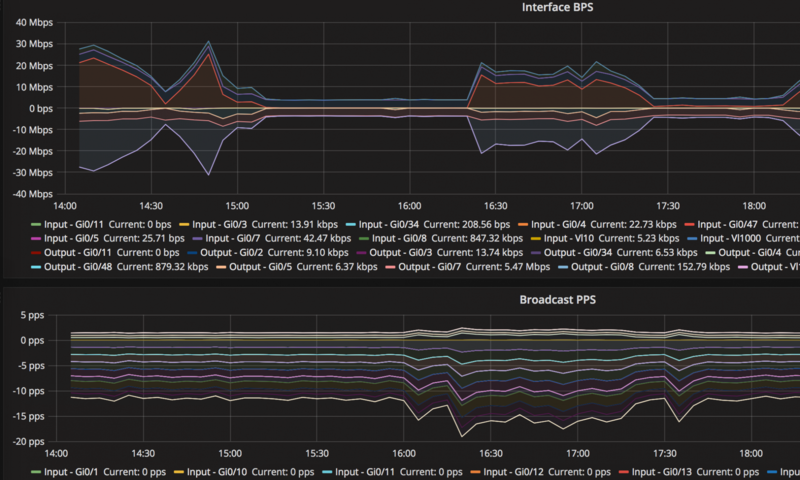 Here’s a sample grafana dashboard that will graph this data. You can download the dashboard layout here. Onkyo’s are not good network devices. They constantly spew all sorts of crap, and there’s no ability to turn it off via configuration. And the crap they spew is pretty worthless – e.g. even their basic SSDP stuff doesn’t follow the recommendations. Just do a pcap (Wireshark, or whatever) to see. Then compare with other manufacturer’s. I got rid of my Onkyo for a Denon, which is much more network friendly. Yeah, I did some traffic analysis with Wireshark while troubleshooting this issue and noticed that exact thing. After multiple days of traffic capturing, I wasn’t able to determine the exact traffic or protocol that causes the receiver EISCP services to crash unfortunately. Next PostNext Backup configuration of a Palo Alto Firewall With Powershell!